Grew sales by 5% annually. Grew operating income by 10.5% annually, increasing operating margins from 10.3% to 17.1%. Grew net income by 13.9% annually. Achieved average return on equity of 71% (32% over the past five years). Increased shareholders’ equity nearly tenfold, from $1.15 million in 2002 to $11.3 million in 2012, while paying annual dividends. Reduced assets/equity from 6.6x in 2002 to 1.7x in 2012. With stats like these, you may be wondering what wonderful line of business The Marketing Alliance is in. As is so often the case with successfully compounding companies, The Marketing Alliance’s core line of business requires little capital investment and generates significant intangible assets in the form of business relationships and network effects. The Marketing Alliance (“TMA”) provides a platform for independent insurance brokers to aggregate their purchasing power. The Marketing Alliance negotiates on the behalf of these independent brokers with large insurance companies, helping them to obtain better commission rates. The Marketing Alliance also provides assistance with practice management and support. In return for these services, TMA receives a cut of the commissions generated by these brokers. Like nearly all great businesses, TMA’s insurance platform generates capital beyond what is needed for reinvestment. Excess capital creates opportunities for growth. The Marketing Alliance has chosen to invest its capital beyond its core business into other lines of business. The man in charge of directing TMA’s capital allocation is Timothy M. Klusas, appointed president in 2005. Mr. Klusas has a background in corporate development and strategy at Eaton Corporation. In July, 2011, TMA purchased the assets of JDC Construction. JDC does erosion control, conservation and other construction services. The price was not disclosed, but the transaction seems to have been a successful one. In the five full quarters following the acquisition, JDC produced $1.44 million in operating income. TMA’s latest venture is the acquisition of two “Monkey Joe’s” family entertainment centers located in the St. Louis area. Time will tell if this latest venture will be a success, but the centers were profitable in the most recent quarter. The Marketing Alliance’s revenues, operating income and net income hit record highs in the four trailing quarters as of the second quarter of fiscal 2013 ended September, 2012. The company does not publish a schedule of cash flows. Commissions revenue in the quarter ended September 30, 2012 was up 7% over the same quarter of 2011. Construction revenue rocketed 41% from a year ago, reaching 11.9% of total revenues. While TMA’s earnings have reached new highs, the company still has plenty of “dry powder.” Cash at quarter’s end was $5.42 million. Assuming the company requires cash balances of 5% of revenues for working capital purposes, TMA is holding $4 million in excess cash. TMA also holds $4.19 million in marketable investments. The nature of these investments are not disclosed by the company. However, given the size of gains and losses on these investments in prior years, it can be assumed they are equities. 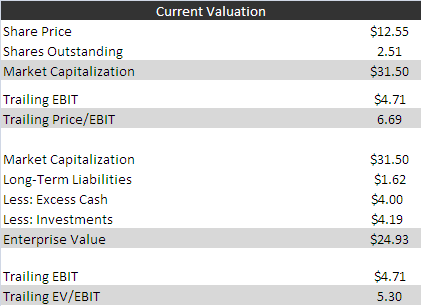 Gains and losses on the company’s marketable securities portfolio influence net income from year to year, so comparing market capitalization or enterprise value to operating earnings/EBIT is a more consistent method. On that basis, The Marketing Alliance looks very reasonably valued. TMA’s annual depreciation expense is a small fraction of operating income, indicating an EV/EBITDA ratio just slightly lower than EV/EBIT. 6.69 times operating income (unadjusted for excess cash and securities) seems quite a fair price for a company with The Marketing Alliance’s record of growth and compounding. The company offers a 3% dividend yield. As with any company, TMA has its share of risks. The biggest is the possibility that the company’s core insurance services platform will cease growing or shrink. Americans are buying fewer life insurance policies than before. What’s more, many of the insurance brokers in TMA’s network are older than 50 and at or past their peak earnings years. It remains to be seen if TMA will be able to replace retiring brokers with others at the same level of annual commissions. Even if TMA’s roster of brokers can be maintained, competition could reduce profits. While it has been successful, The Marketing Alliance is a still a very small, regional company without the deep financial resources or national base of other insurance brokerage services providers. Capital allocation is also a risk. Thus far, Mr. Klusas has shown skill in dedicating capital to profitable acquisitions and has also seen fit to return capital to shareholders through dividends. However, Mr. Klusas has been at the helm for not quite a decade and still has plenty of time to make mistakes or develop an ego or get lazy. Here’s to hoping he doesn’t, but it’s possible. If, on the other hand, The Marketing Alliance can maintain and grow its core business and invest excess capital in profitable side projects, investors could continue to see the intrinsic value of their investment compound for years to come. Awesome find! Love what I see so far. If Klusas is performing so well with invested money, why pay a dividend? What is stopping you from investing? nice 10 yr financial history… I think TMA has differentiated itself from its competitors in its core business partly by doing the back end work for its client brokers — it does all the paperwork on the policies (that is a big help to the clients who can then focus on sales).. I am in canada but the industry is the same here but the businesses similar to TMA here do not do the back end work, they only create the relationships to all the good underwriters and offer their policies to the brokers as intermediary service. In my opinion their core business looks very stable … Interestingly, but Timothy Klusas seems like a real value investor (Buffet type) and probably could (and would be keen to) put some of his extra 4mil cash to work on some companies similar to those mentioned herein ..
Hello! buy valtrex online excellent web site.